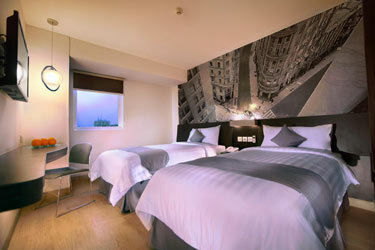 Jakarta, 11th October 2013 – Becoming the fourth NEO hotel to grace Indonesia’s capital, Hotel NEO Mangga Dua Jakarta opened today. Bringing leisure and entertainment in the city to a whole new level, Hotel NEO Mangga Dua Jakarta is a superior select service hotel and the area’s newest, most modern and only non-smoking property. Complete with upscale facilities and professional service, the hotel has been created to meet the needs of the modern-day urban professional, offering a stylish yet affordable hotel alternative. Each of the 154 guest rooms have been elegantly appointed and equipped with all the latest amenities to ensure an unforgettable experience. Hailed by many loyal guests as the best in class of budget hotel rooms, the hotel offers an intimate and comfortable retreat for weekend getaways and business trips. All rooms are fitted with individually regulated air conditioning, double/king-size or 2 twin beds featuring top of the line mattresses, mattress toppers and soft cotton linens, as well as a direct dial telephone, satellite/cable TV, an in-room safety box, writing desk with universal power outlets and Tea & Coffee making facilities. The en-suite bathrooms are equipped with a shower, vanity mirror and hairdryer. The hotel itself boasts 5 versatile meeting rooms to cater to its professional guests, as well as an all day café-shop, ample parking space and complimentary high-speed WiFi throughout the entire hotel. Despite the challenges with WiFi in Indonesia, rest assured Hotel NEO Mangga Dua provides more bandwidth per room than any other hotel group in the archipelago. Situated in the heart of Jakarta's Chinatown district, Hotel NEO Mangga Dua is just 10 minutes from the Ancol Dreamland Park and smack in the middle of North Jakarta's Mangga Dua “Superhub” complex with its many malls, wholesale centers and endless dining options. The hotel is also within easy walking distance to factory outlets, a hypermarket, a wide choice of hangouts for food lovers, an international executive club, a cinema, and much more, while the toll road provides easy access to the Soekarno Hatta International Airport which is approximately 30 minutes from the hotel.